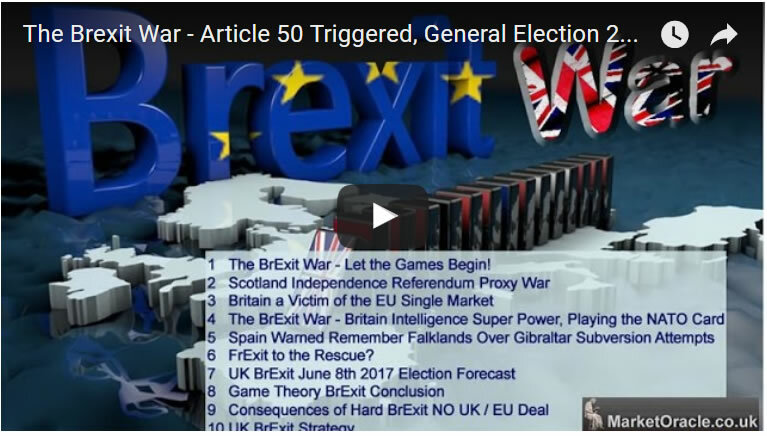 The Brexit War - Article 50 Triggered, General Election 2017 Called - Let the Games Begin! On Wednesday 29th March 2017 Theresa May's post man in Brussels hand delivered a 6 page letter to Donald Tusk the President of the European Council, triggering Article 50 of the Lisbon Treaty starting the formal process for the UK exiting the European Union within 2 years' time, with the negotiations expected to begin during May following the conclusion of the French Presidential elections. And then on 18th April Theresa May surprised everyone by calling a BrExit snap UK General Election on 8th June 2017. And this really was a surprise to all because previously she has repeatedly stated that she would not be calling an early general election. Instead in a statement today she made clear that her slender majority in the House of Commons was not large enough to secure a strong BrExit outcome for the United Kingdom. In this series of 10 videos based on my two pieces of in-depth analysis published at the market oracle site, updated as each video is completed and published aims to map out the dynamics of the BrExit War that is set to unfold between the UK and the European Union and what actions the UK needs to take to ensure victory. Including what Game Theory suggests the UK should do virtually immediatly following the outcome of the June 8th General Election.